Hearts of Oak emerged winners of the accra derby as they defeated Dansoman-based Liberty Professionals by 3-1 in match day 5 of the competition. Kojo Obeng Junior’s only goal of the game secured the win for the Phobians in this crucial encounter at the Carl Reindorf sports stadium. 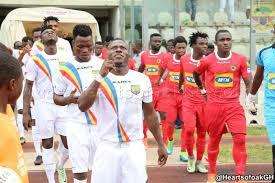 This victory comes as Hearts of Oak’s second consecutive win in the competition after beating Dwarfs last wednesday. Elsewhere, Asante kotoko salvaged a point against Bechem United on Sunday in the Special Competition. Bechem United took the lead through Kojo Owusu Achaw when heading the ball into the net from a Charles Mensah free kick. Abdul Fatawu scored from the penalty spot to secure a point for the porcupine Warriors in the 71st minute. Fatawu has currently scored 5 goals in 3 games for the porcupine Warriors. Amos Adai scored the only goal of the game for AshGold as his side won by a lone goal against Medeama at the Obuasi Len Clay sports stadium. the game saw players from both sides red-carded as the game turned physical. Karela United continued with their impressive run within the Special Competition as they recorded a 3-0 win over inter Allies at the crosby Awuah memorial park on Sunday.